This post shows you how to Unit and integration test your Data layer, service layer and view layer in a Spring 4 MVC + Hibernate 4 + MySQL + Maven integration application. This post is continuation of Previous post. In this post we will learn how to add unit and integration test in SpringMVC and hibernate based maven project using TestNG, mockito, spring-test, DBUnit & H2 database. To know more about testing with TestNG in general, please refer our TestNG Tutorials. Let’s get going. It’s same directory structure as in previous post. What’s new is that we have added src/test/java & src/test/resources folders and testing artifacts. We will maintain the same package structure in test as in src folder. Just to recall that dependencies spring-test, testNG, mockito, h2 & DBUnit are all here for Testing purpose only. Spring-test : We will be using spring-test annotations in our test classes. TestNG : We will be using TestNG as our testing framework (& it’s my favorite anyway). Mockito : We would be time to time doing some mocking, like mocking dao when testing service. H2 Database : For database layer, it’s more of integration-test than unit-test. IMO, unit tests does not bring real value while testing data layer. We will be using in-memory H2 database to do our integration-tests. Let’s Start some real testing. 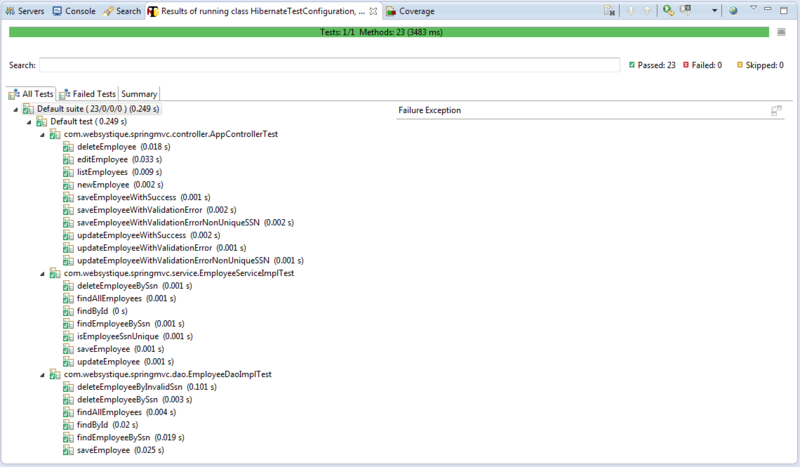 Here i used TestNG Eclipse plugin to run this test class. If you revisit AppController class in Previous post, you will see that AppController basically depends on EmployeeService , MessageSource, Employee, ModelMap & BindingResult to fullfill all of it’s duties. Each of the AppController method is using only of these objects to do it’s real job. 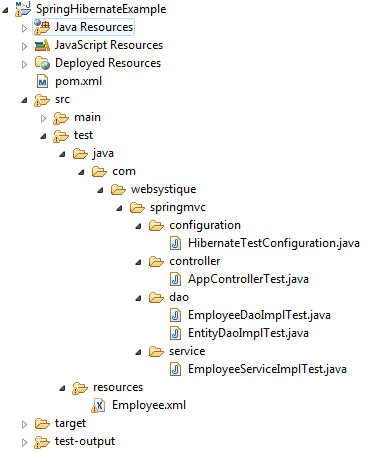 So in order to test AppController, we would need to provide these dependencies. In our example, we do it using Mockito framework. We provide mock of EmployeeService & MessageSource by applying @Mock annotation on them. We also provide spy objects of ModelMap , BindingResult & Employee by applying @Spy annotations on them. It’s important to understand that Mockito’s @Mock objects are not real instances, they are just bare-bones of instance created using Class of type. But their main capability is that they can remember all the interactions [operations performed] on them. @Spy objects are on the other hand real instances, but with additional capabilities of remembering all the interactions [operations performed] on them. @InjectMocks creates an instance of the class and injects the mocks that are created with the @Mock/@Spy objects in it. Make sure to call MockitoAnnotations.initMocks when using Mockito annotations, else those mocks will be useless for your tests. Annotations @Test & @BeforeClass are TestNG specific annotations. Assert is the TestNG api for doing assertions on expected result and actual result. when..then & verify are popular stubbing and verification techniques used in tests to define the behavior and then optionally verifying that behavior was indeed executed. There are many more. Please refer to TestNG tutorial for in depth details about writing tests using TestNG, mockito and other supportive libraries. If you revisit EmployeeServiceImpl class in Previous post, you will see that EmployeeServiceImpl basically depends on EmployeeDao & Employee to fulfill all of it’s duties. Each of the EmployeeServiceImplmethod is using only of these objects to do it’s real job. As explained above, in order to test EmployeeServiceImpl, we would need to provide these dependencies. In our example, we do it using Mockito framework. We provide mock of EmployeeDao by applying @Mock annotation on it. We also provide spy objects of Employee by applying @Spy annotations on them. So, Make sure to call MockitoAnnotations.initMocks when using Mockito annotations, else those mocks will be useless for your tests. Please refer to TestNG tutorial for in depth details about writing tests using TestNG, mockito and other supportive libraries. Testing DAO or data layer is always a subject of debate. What exactly we want to test? Are we just testing the methods from DAO implementation class and making sure that each and every line of code in those methods is covered? If we think in terms of unit-test, than our goal becomes testing every line of DAO code while really mocking all the external systems/dependencies. IMO, we can’t truly test a data-layer without really interacting with the database itself. And then it becomes an integration test. Anyway, we will perform integration-test on our DAO layer to make sure that it works as expected. We will be using in-memory H2 database to do our integration-tests. If we look back at actual dao/data-layer class EmployeeDaoImpl in Previous post, it relies on hibernate for database interactions. There all hibernate setup related stuff was defined in HibernateConfiguration class. We will need similar setup in tests in order to connect to database and perform hibernate session related operations during our tests. Below class is a setup class [with Annotations] for all hibernate configuration related activities during tests. * This class is same as real HibernateConfiguration class in sources. * implementations are specific to Hibernate working with H2 database. Above class is exactly same as HibernateConfiguration class defined in src in Previous post. Only difference is that mathods dataSource() & hibernateProperties() are implemented specific to Hibernate & H2 combination. I choose to make a separate test configuration class and not to pollute existing class in Sources with testing related stuff. It does everything exactly same as the one in Sources folder: it creates a SessionFacoty using a dataSource which is configured to work with in-memory database H2. In order to make hibernate work with H2, we also need to specify the dialect being used [H2 Dialect]. This SessionFactory will be injected in our AbstractDao class defined in Previous post. And from then on, the actual DAO implementation classes [ EmployeeDaoImpl] will use this sessionFactory when running tests against them. Additionally, we will be using DBUnit to clean-insert sample data in test database[H2] before each test case execution, in order to prepare database before each Dao method execution. This way we make sure that the tests method do not interfere with each other. Below is a sample class which will act as a base class for all our test classes. AbstractTransactionalTestNGSpringContextTests can (at some extent) be considered as JUnit equivalent of RunWith. This abstract class integrates Spring TestContext support in TestNG environment. It requires a class-level @ContextConfiguration in order to load ApplicationContext using XML configuration files or annotated @Configuration classes. It also requires a datasource and a transactionManager to be defined in ApplicationContext in order to provide data-access support during testing. We have already defined both datasource & transactionManager in our @Configuration class. Thanks to transaction support, by default a transaction will be started before each test, and then this transaction will be rolled back at the end of test. You may override the rollback behavior. Look at setup method annotated with @BeforeMethod. Method annotated with @BeforeMethod is called before each test, so it is an ideal place to do something which is required before each test. In our case , we want the in-memory database to be clean and predefined sample data to be inserted before each test. We will do it right here. Additionally, for DBUnit to connect to database in order to perform clean-insert, we have to provide a dataSource for it. That’s why we declared a dataSource here, which will be autowired with dataSource defined in HibernateTestConfiguration class. As shown in above setUp method, firstly we create a connection to database using dataSource available( which will be test dataSource), and execute clean-insert on DB via DBUnit. Notice the abstract method getDataSet above. This method will be implemented in our tests classes in order to provide the actual test data to be inserted before each test. Finally, the actual test class which tests methods from our DAO implementation class. Let’s take saveEmployee test case and understand how things happening here. 1) Before any of the test from the classes (which are extending EntityDaoImplTest) starts executing, Spring will load the text context from the configuration classes associated with @ContextConfiguration annotation & create the beans instances defined in those classes, thanks to AbstractTransactionalTestNGSpringContextTests. This will happen only once. Thanks to this hbm2ddl property, when the SessionFactory is created, the schema related to our Model classes will be validated and exported to database. That means Employee table will be created in H2 database. 4) Now the actual test case saveEmployee finally starts it’s execution. It will call employeeDao.saveEmployee(getSampleEmployee()); which in-turn will insert the one pre-defined Employee object into H2 database using hibernate. This is the core logic of saveEmployee method anyway. After this operation there will be total 3 rows in Employee table in H2 database. We will assert it for success/failure. Test completes. 6) When all our tests are done, session will be closed and schema will be dropped.